"WR6_gUnUj-ztiW07KQcOCnTel9A"/> Notes From Atlanta: A Blue-Eyed, Blond-Haired, Pale-Skinned White American Woman Terrorist! A Blue-Eyed, Blond-Haired, Pale-Skinned White American Woman Terrorist! 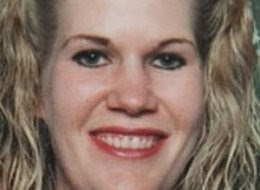 The Associated Press just published a truly intriguing story today: Someone from an "unlikely" demographic category-- a blue-eyed, blond-haired, pale-skinned, suburban white American woman identified as Colleen LaRose--has been implicated in a terrorist plot. In 46-year-old LaRose, the worst fears of the American intelligence and counter-terrorism have materialized. Right-wing cocksureness about the propriety of profiling only non-white Muslim males has also been exploded. One is left to wonder if all people who share the same demographic characteristics as this lady will be now subject to increased scrutiny at airports and elsewhere? 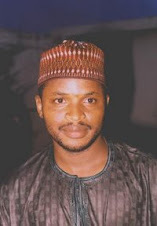 That's precisely what the U.S. government did to Nigerians in the wake of the attempted terrorist attack on a Northwest airline by Umar Farouk Abdul-Mutallab, who happens to be a Nigerian. All Nigerians--irrespective of their religious affiliations, ethnic identities, personal beliefs--have now been tarred with the same brush on account of the lone act of attempted terror by one crazed, misguided individual. And that has been the fate of Middle Easterners who have had the misfortune to share the same race, nationality, and religion as people who commit heinous acts of terrorism. But the truth is that terrorists--or other scum of the earth who make life miserable for innocents--are often an unrepresentative minority of any group of people. And no nation, race, religion, or demographic category has the exclusive preserve of bad people. We are all one big human family. The superficial physical and geographic characteristics that differentiate us don't define us; they are incidental to our humanity. I hope this woman's arrest drives home that time-honored, elemental truth. But the story says the woman was arrested in October 2009, that is, more than two months before the Abdul-Mutallab incident. Why is it just now being brought to public attention? What am I missing here? PHILADELPHIA – A suburban woman "desperate to do something" to help suffering Muslims has been accused of using the Internet to recruit jihadist fighters and help terrorists overseas, even agreeing to move to Europe to try to kill a Swedish artist, prosecutors said Tuesday. Authorities said the case shows how terror groups are looking to recruit Americans to carry out their goals. A federal indictment charges that Colleen R. LaRose, who called herself JihadJane and Fatima LaRose online, agreed to kill the Swede on orders from the unnamed terrorists and traveled to Europe to carry out the killing. It doesn't say whether the Swede was killed, but LaRose was not charged with murder. A U.S. Department of Justice spokesman wouldn't confirm the case is related to a group of people arrested in Ireland earlier Tuesday on suspicion of plotting against Swedish artist Lars Vilks, who depicted the Prophet Muhammad with the body of a dog. But a U.S. official speaking on condition of anonymity said LaRose had targeted the Swedish cartoonist and had online discussions about her plans with at least one of the suspects apprehended in Ireland. The official wasn't authorized to discuss details of the investigation. LaRose, who has blond hair and blue eyes, indicated in her online conversations that she thought her appearance would help her move freely in Sweden to carry out the attack, the indictment said. In a February 2009 online message to a co-conspirator in south Asia, she said her physical appearance would allow her to "blend in with many people," which "may be a way to achieve what is in my heart," the indictment said. "I will make this (killing the artist) my goal till I achieve it or die trying," she wrote another south Asian suspect in March 2009, according to the indictment. LaRose, 46, lived in Pennsburg, Montgomery County, Pa., before moving to Europe in August 2009, authorities said. She called herself JihadJane in a YouTube video in which she said she was "desperate to do something somehow to help" ease the suffering of Muslims, the indictment said. According to the 11-page document, she agreed to obtain residency in a European country and marry one of the terrorists to enable him to live there. She traveled abroad with a U.S. passport stolen from a male friend and intended to give it to one of her "brothers," the indictment said. She hoped to "live and train with jihadists and to find and kill" the targeted artist, it said. LaRose also agreed to provide financial help to her co-conspirators in Asia and Europe, the indictment charged. LaRose has been in federal custody since her Oct. 15 arrest in Philadelphia, authorities said. She had an initial court appearance the next day but didn't enter a plea. Her federal public defender Mark T. Wilson declined to comment Tuesday. Department of Justice spokesman Dean Boyd said the case represents "one of only a few such cases nationwide in which females have been charged with terrorism violations." He declined to comment further on it. But neither of those cases involved the kind of plotting attributed to LaRose — a woman charged with trying to foment a terror conspiracy to kill someone overseas. Associated Press Writer Devlin Barrett contributed to this report from Washington. LEADVILLE, Colo. – Before her daughter disappeared last fall, Christina Mott recalls that the 31-year-old who had been held in connection with an alleged assassination plot announced she had converted to Islam and told them they'd go to hell if they didn't follow in her steps. Jamie Paulin-Ramirez also began talking about Jihad with her Muslim stepfather and spent most of her time online as she withdrew from her family, Mott said. "We were enemies," Christine Mott, 59, said. "We couldn't even speak to each other." Paulin-Ramirez left Leadville, Colo., an old mining town west of Denver, on Sept. 11, and took her 6-year-old son with her, her mother said. A U.S. official, who was not authorized to discuss the investigation and spoke on condition of anonymity, said Saturday that Paulin-Ramirez had been detained in Ireland in connection with an alleged plot to kill cartoonist Lars Vilks, whose 2007 sketch depicted the head of the Prophet Muhammad on a dog's body, offending many Muslims and provoking terror front Al-Qaida in Iraq to offer a $100,000 bounty for his slaying. Irish police said later Saturday that they had released an American woman and three others arrested in Ireland over an alleged plot to assassinate Swedish artist Lars Vilks had been freed without charge. Three others remained in custody and were being questioned. Irish police refused to confirm whether Paulin-Ramirez is the woman in custody, and have declined to release the identities of any of those arrested. Smoking as she sat on her living room couch in Leadville, Christine Mott said she hadn't eaten in days. She described her daughter as troubled single mother who had the "mentality of an abused woman" and who, in trying to escape her loneliness, may have spiraled into the depths of Islam extremism. Her reported arrest came hours before U.S. authorities unveiled a terror indictment against another American woman, Colleen LaRose, of Pennsylvania. 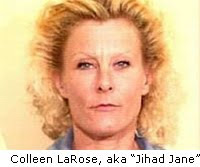 U.S. authorities on Tuesday unsealed terror charges against the 46-year-old LaRose, who allegedly went by the name "Jihad Jane" to recruit others online to kill the cartoonist. Mott told The Associated Press that she learned of her daughter's arrest in the case from the FBI and other federal law enforcement agencies. Denver FBI officials said Saturday they couldn't confirm that the FBI had contacted Mott about the case. Mott said that Paulin-Ramirez told her family after she left in September that she went to Ireland with her 6-year-old son and married an Algerian whom she met online. Before abruptly leaving Colorado, Paulin-Ramirez had been a straight-A nursing student and worked at a clinic in Edwards, about 40 miles west of Leadville, her mother said. She moved to Leadville from Denver six years ago. Phone calls to the clinic in Edwards went unanswered Saturday. Mott tells the AP that her daughter told her family during Easter last year that she converted to Islam, and renamed her son. Mott said her daughter was teaching him to hate Christians as she grew more distant from her family. When she discussed Jihad with her stepfather, George Mott, who has been a Muslim for more than 40 years, she told him "she'd strap a bomb for the cause," Christine Mott said. "To go blow somebody up?," said Paulin-Ramirez's mother, who is not Muslim. "That's never been Islam." Mott said her Paulin-Ramirez spent much of her time on the computer but she didn't always know what her daughter was doing. "I'd yell at her, 'Get off the damn computer, do something with your son," Christine Mott said. She said her Paulin-Ramirez liked going on fishing and camping trips but grew distant before her departure. She said her daughter was married three times before she left for Ireland, and that her first husband used to beat her. Her second husband, the 6-year-old's father, was an illegal immigrant from Mexico and was deported years ago, Christine Mott said. She said she believes her daughter was lonely and she "got sucked in" and brainwashed by other people. Growing up, her mother said Paulin-Ramirez was "the kid in the class everyone picked on and made fun of." George Mott said the family had not been in touch with Paulin-Ramirez since news of her release and did not know where she might be or if her son was with her. "That baby is my heart, he is my reason to breathe," Christine Mott said crying, later recalling her weekly phone conversations with him. Her last phone call with him was Monday. "When we talk," she recalled, "We give each other hugs and kisses on the phone," she said, putting her arms across her chest. During a recent phone call, Christine Mott said, her grandson told her that "all Christians will burn in hellfire." But during another phone call, her grandson was excited to hear about a new kitten at the Motts' home in Leadville. "When I told him about that he said name the kitten my name, Christian," Christine Mott said. "He knows who he is. I don't care how many times they call him this Muslim name, he knows his name is Christian." Among the people Paulin-Ramirez had also communicated with online was a man from Pakistan who told her he wanted to come to the U.S. to learn how to fly, the Motts said. "She lost her mind," Christine Mott said. "I told her, 'That should be a red flag right there.'" Christine Mott said Ramirez began calling her 6-year-old son "Walid," or "Wahid." Paulin-Ramirez grew up in Blue Springs, Mo., and few people in Leadville appear to know her. The mayor of Leadville, Bud Elliott, said Saturday that he knew the Motts casually but wasn't well acquainted with Pailin-Ramirez. "She's a lady that appears to have had a very sad and troubled life," Elliott said. An early silver mining camp, Leadville was once Colorado's second-largest city. George Mott said the FBI seized a desktop computer in late September but did not tell the family what they found. Associated Press Writer Peter Banda and Devlin Barrett contributed to this report.